What makes a classic RPG? Everything! In the past few weeks, I've noticed a few different sources that have used isometric perspective as an indicator of classic role-playing games. First, GOG.com advertised the new throwback RPG Inquisitor by saying it was "true to the isometric roots of classic PC gaming." Then Obsidian's Project Eternity Kickstarter heralded its isometric perspective regularly. I found this focus on perspective to be a little confusing. Certainly I love Diablo and Fallout and other isometric RPGs, but the genre has such variety in it that focusing single components seems narrow. But what if I was wrong? What if classic RPGs actually are almost all isometric, or turn-based, or story-driven, or open-world? What if there isn't that much variety after all? So I decided to test my theory that classic RPGs come in a variety of flavors. I made a list of the most important and famous western, non-massively multiplayer role-playing games – which spanned 50 titles. Then I looked at the components that usually distinguish RPGs from one another: perspective, combat style, complexity of character development, story importance, whether there are puzzles, geography, and how the game provides the character(s) you control. What I found is that the RPG genre is not easily categorized. What I found was a genre filled of diverse titles. Perspective: To say that RPGs can look different from one another is an understatement. I had five different major categories: first-person (Skyrim), third-person (Knights Of The Old Republic), isometric (Fallout), overhead (Ultima VII), and tiled, which is a first person perspective where you move forward in squares, like in Dungeon Master, Wizardry, and this year's The Legend Of Grimrock. My favorites are almost equally divided up between those five categories, and they've each got 7-10 games included. The only really interesting thing about this division: the only third-person games I listed are BioWare games. There were also a few outliers – the partial tiles of Betrayal At Krondor, and the adventure game perspective of Quest For Glory – as well as the fairly common tiled dungeon/overhead tactical combat in older RPGs. Combat: This is one of the great debates in RPGs. At the extreme ends, there are people who think that anything that's not pure turn-based is a betrayal of the genre, or those who think that RPGs should be like the best action games with skill trees. Yet obviously there's a diversity, from the rapid clicking of Diablo to the hybrid systems of the Infinity Engine games and turn-based tactical combat of Jagged Alliance II. As with perspective, I thought I'd split this roughly evenly or even lean turn-based. To my surprise, it leaned real-time. Only 15 of the games on the list were pure turn-based, while 21 were real-time. The remainder were hybrids, like the "real time, but you pause all the time" Baldur's Gate or the timed turn-based combat of Dungeon Master and its successors. 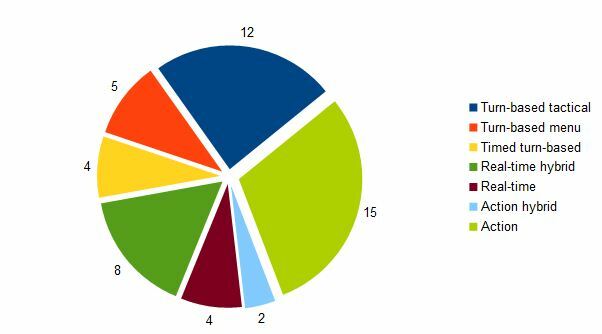 The games I labeled "Action," a diverse set that includes games from the The Elder Scrolls, Mass Effect, and Diablo series and defined as requiring player skill for victory, was the most popular sub-set with 15 games, with 11 of the games. Turn-based combat wasn't far behind, but it was divided between tactical and menu-based combat systems. Progression Complexity: The question behind this division is simple: how much time to you spend building your character(s) after you've created them. Early attribute-based RPGs would be at the low end of the spectrum, where the characters were who they were and only really changed with equipment. On the other hand, games like Wizardry VII and, later, Fallouts and Dragon Ages involve near-constant decision-making. This split pretty evenly, with games of medium complexity, like Betrayal At Krondor's skill focus selections being the most common. Story Importance: How much time in the game is spent on conversation, narration, and cutscenes? A game like Rogue stands on one end, with Mass Effect on the other. I didn't try to massage this data in any way. I just listed the games, and wrote down how important I thought their stories were to them. Yet even I was surprised when this section came down with a perfect split: 17 games with a lot of story, 17 with a decent amount, and 16 with very little embedded narrative. Puzzles: I don't know about you all, but I have some issues with puzzles in my RPGs. It's part of the reason that Dungeon Master-like games don't sit well with me. I didn't find the amount of puzzles to be quite so perfectly balanced as stories, but it was once again a fairly even split between games without puzzles, games with puzzles the players had to solve, and games where the character solves puzzles with proper skills. Geographical Structure: I've written before on the structure of storyline within geographical spaces, which is something I'm not sure game criticism focuses on enough. 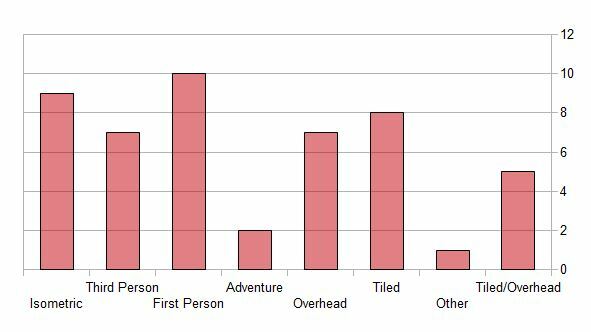 How you spend your time in an RPG is critical, and much of that is traveling to and exploring spaces for different reasons, within different contexts. Skyrim is the recent reigning champion of open-world exploration games, giving it a very different feel from Dragon Age 2's single location. Fallout may be turn-based and isometric, but it feels quite similar to other quest hub-using games like Knights Of The Old Republic. I also included a category for linear games, by which I don't mean you travel in a straight line, but that you complete particular areas in order, which usually removes them from later consideration – Deus Ex's travels from New York to Hong Kong and so on fit this category. There are also dungeon crawlers, where the goal is to conquer a single or group of dangerous locations, and if towns exist at all, they're there to resupply before heading back in. 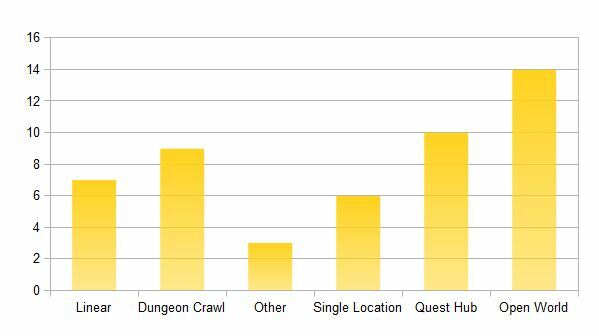 Rogue is the ideal form of a dungeon crawler. Once again, I found notable variety. 16 open-world games made it the clear favorite, but there were at least six examples of each of the others. This is also the category I had the most difficulty in categorizing. Fallout 3 feels more open-world than quest hubs in New Vegas do to me, but it's a gut decision, and I could easy switch either's category. I couldn't even figure out how to fit Baldur's Gate and Mass Effect 2 into these categories. 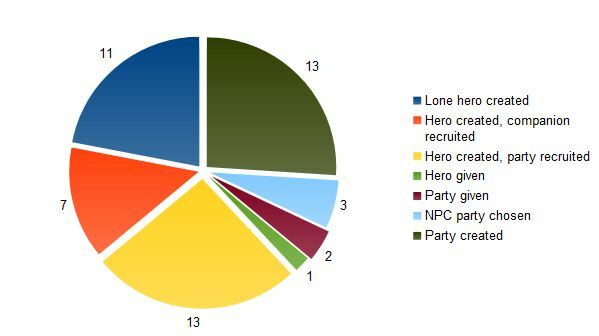 Character/Party Composition: I've called the switch from party creation to single-character with recruitable companions one of the most important shifts in RPG history. That's true-only one of the 13 games with full party creation on my list is a post-1995 non-sequel (Icewind Dale, with Wizardry VIII and Might & Magic VI the two sequels). But other than that, once again, there's a wide variety of games where you create a single character, recruit a lone character then a companion, or recruit a full party. There's also a dozen where you play as a lone character, one of which, The Witcher 2: Assassins of Kings, doesn't even begin with customization. When I started this little project, I expected a variety of RPG forms. I expected to say that isometric perspective wasn't such an important component of classic games, or that there were a bunch of different successful combat styles. But I really didn't expect the balance at so many levels. There has been a fantastic array of different role-playing games through the years, and the critical questions of how to build them have never answered. It's clear that there's no one best way to build a classic RPG. It's also clear that this is the most diverse genre in video game history.